One day in the late 1990s, Myria walked into the Irvine High School computer room and spotted a boy playing Final Fantasy V. There were two unusual things about this. The first was that Final Fantasy V had not actually come out in the United States. To play the 1992 Japanese game in English, you’d have to download a ROM, then install the unofficial fan translation patch that had recently begun circulating the internet. Myria knew about this patch because of the other unusual thing: she helped make it. Twenty years later, Myria has gotten used to meeting people who have played through the unauthorized English version of Final Fantasy V. Although it wasn’t the first video game fan translation—that would be the Dutch translation of MSX game SD Snatcher in 1993—it was the most influential. It taught countless Westerners that Squaresoft’s “Final Fantasy III” wasn’t really the third Final Fantasy, and more importantly, it showed people the power that fans can have on the video game industry. Sick of watching companies like Square refuse to bring games west, fans simply localized Final Fantasy V themselves, as they would again in future years for RPGs like Seiken Densetsu 3 and Mother 3. They’d translate the scripts from Japanese to English, smooth out the language, and implement those scripts into the games using increasingly elaborate programs. Myria can’t remember exactly when she found out about Final Fantasy’s number problem—it was either 1996 or 1997—but she does recall seeing an advertisement for Final Fantasy VII. “We’re like, ‘Huh, seven?’” she said, echoing the thoughts of RPG fans across the United States. Just a few years earlier, in 1994, Squaresoft had released Final Fantasy III on the Super Nintendo. How’d they get from three to seven? As it turns out, Square was holding out on North America. The venerable publisher had passed on localizing both Final Fantasy II and Final Fantasy III on the Nintendo Entertainment System, so when it came time to bring Final Fantasy IV to the west, they called it Final Fantasy II. Then, Square decided to skip Final Fantasy V, although they briefly considered releasing it here with a different name, according to their head localizer, Ted Woolsey. When they brought over Final Fantasy VI, they called it Final Fantasy III. Unlike the two NES games that we’d missed out on, Final Fantasy V was by all accounts excellent. 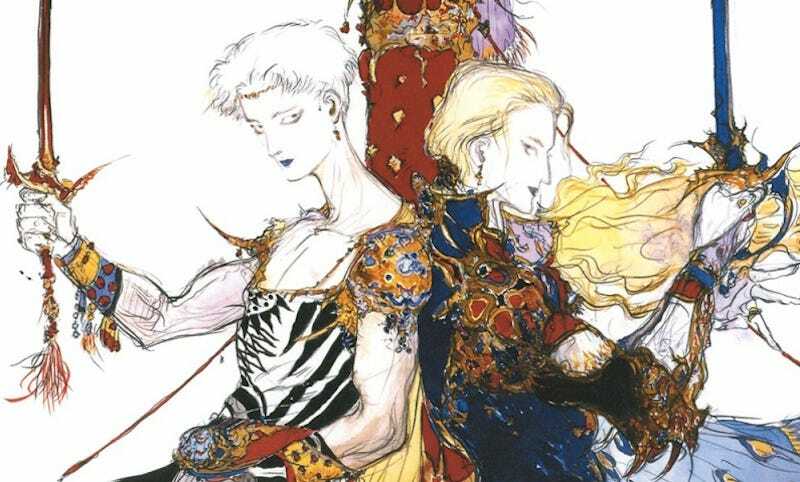 People lucky enough to understand FFV in Japanese reported that it was a blast to play, with a solid story and an elaborate class-changing system that allowed players to customize their party in creative ways. It could be difficult, which was one of the reasons Square hadn’t brought it west, but RPG fans wanted to check it out nonetheless. Problem was, RPGe’s methods were flawed. Nobody had done anything like this before, so there was no institutional knowledge about how to handle fan translations. The RPGe crew had dug up a Japanese ROM of Final Fantasy V, then cracked it open and started editing the text files, directly translating chunks of the game from Japanese to English. But these files were finicky and tough to handle. When you changed a line of Japanese to English in the ROM, it wouldn’t display neatly in the game, because Japanese characters were rendered so much differently than English ones. Japanese characters are bigger than English letters, and one sentence that takes 12 characters in English (“how are you?”) might just take three characters in Japanese (“元気?”). Final Fantasy V capped each line of dialogue at 16 characters, which looked fine in Japanese but would make an English translation garbled and hard to read. In order to localize a Japanese game in English and make it readable, Myria decided they would need to reprogram the game. Their version of Final Fantasy V would need to understand that English letters, unlike Japanese characters, have different sizes. They’d need to teach the game that each dialogue box should allow more English characters (including those pesky spaces) than it does Japanese kanji or kana. Examples, via Clyde Mandelin, of what other fan translations looked like in the 1990s. Midway through the project, they brought in a new editor, Katsuyuki “harmony7” Ohmuro, an upperclassman at Myria’s high school. Ohmuro thought SoM2freak’s translations were flawed and full of problems. SoM2freak was young, and not a native Japanese speaker, so Ohmuro started going through the script and revising big chunks of SoM2freak’s work. Frustrated by this decision, SoM2freak quit the group, although he’d go on to help translate more big RPGs in the following years, like Final Fantasy III and Seiken Densetsu 3. As summer turned into fall, Myria finished up her work on the fan translation, writing a program that could implement the translated English text into the game so they wouldn’t have to spend dozens of hours copy-pasting. Then she left the rest to Ohmuro, who had originally planned to revise the entire script before a dramatic twist forced them to change course. Other groups within RPGe had already given up on their own translations of Final Fantasy V, leaving Myria’s crew to finish it themselves, but in October of 1997, someone (or multiple people) got their hands on an early version of the fan translation and stuck it on a Geocities website, claiming credit for the accomplishment. In order to set the record straight, Myria and Ohmuro had to release their own patch, which was nearly finished, but not as polished as Ohmuro would’ve liked. Ohmuro spent a few more months finishing the ending and polishing the script, and in June of 1998, they released the “official” version of their Final Fantasy V patch. At the time, it was seen as revolutionary, and even today, it’s heralded as one of the best fan translations in gaming history. “The amount of work put into FFV’s translation set the bar for fan translations from then on,” said Mandelin, the localization expert. After looking at Final Fantasy V, prospective fan translators now knew that if they wanted to get a game looking right in English, they’d need to edit code, not just text. Final Fantasy publisher Squaresoft never contacted RPGe about their translation, according to Myria, even though their U.S. offices were in Costa Mesa, just a few miles away from her parents’ house. But in September of 1999, an official English version of Final Fantasy V finally made its way to North America. This version, bundled with Final Fantasy VI in a PS1 compilation called Final Fantasy Anthology, was a mess. After Final Fantasy V, Myria got into PS1 hacking, reverse-engineering old RPGs so she could write her own cheat codes, like a hack for Final Fantasy VII that allowed players to walk through walls. The whole process helped her launch a career in the video game industry. To this day, she puts Final Fantasy V on her resume, and she says without the project, she wouldn’t have learned reverse-engineering.